Would you like to go to Australia with a group of editors from the U.S., Canada and perhaps other countries this summer? 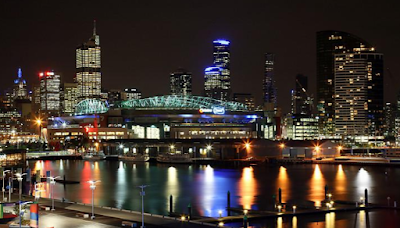 The International Society of Weekly Newspaper Editors will hold its annual conference "down under" from June 28 through July 3, with a post-conference tour through July 8. ISWNE will meet at the University of Melbourne for the first three days, then travel to Bairnsdale for two nights, visiting a wildlife sanctuary en route. Members will stay in the homes of Rotary Club members while exploring the area and conclude with the group's annual awards presentation at a newspaper printing plant. The post-conference trip will go to Sydney with stops along the way, described on this web page, which also has travel advice. "This journey will bring you very close to everyday life in Australia and visiting some of our most pristine and unspoilt natural forests, beaches, lake and escarpment areas," writes ISWNE President Barry Wilson, an Aussie. 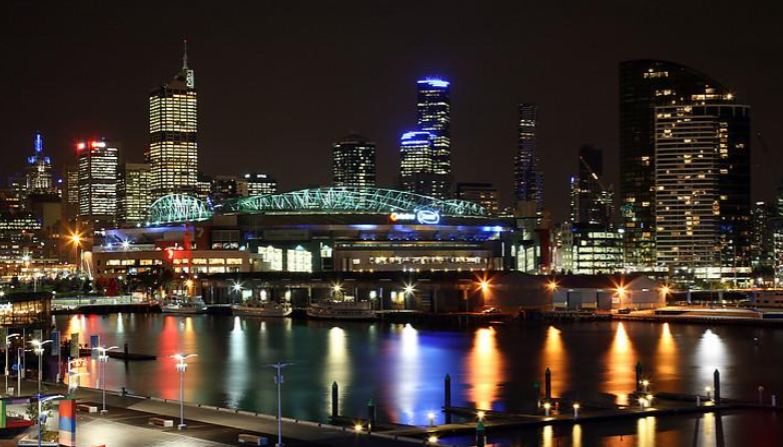 "Australia and ISWNE are waiting to provide an Conference Experience that you’ll not only talk about, but that will give you ideas to help grow your newspaper and your readership." Wilson says details of the itinerary and costs will be determined by late March. The trip will be subsidized by Destination New South Wales, but there will be some residual nights' motel accommodation and meal expenses. The package for five nights, including transportation, is likely to be between $200 and $350 (U.S. currency). To get more information or sign up, email Wilson here.The trip is open to non-members of ISWNE, but if you want to pay annual dues, they aren't expensive: only $60. For more about the group, see www.iswne.org. Daylight Saving Time begins Sunday at 2 a.m. local time, which will become 3 a.m. The device remains controversial for some, while others think the U.S. should move its clocks an hour later year-round. The debate has never been clearly focused, perhaps because daylight time has a different effect depending on your longitude, latitude and distance from time-zone lines. after 6 p.m. on fewer than half the days of the year. 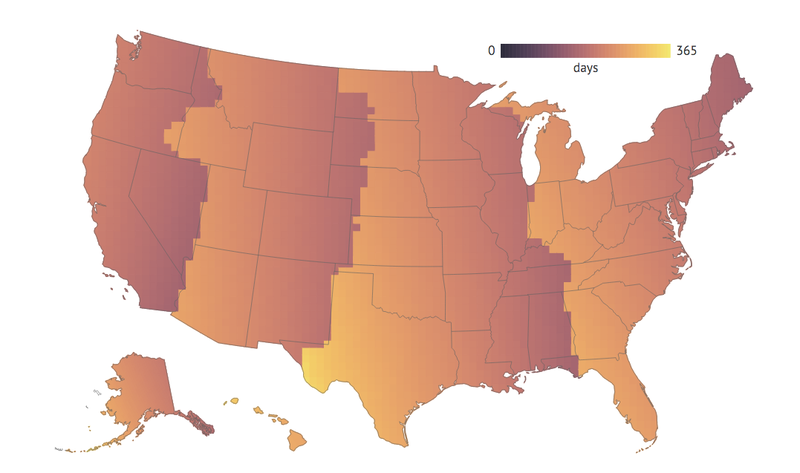 "Woodruff's maps put all these variables together, showing how many days of the year have reasonable sunrise and sunset times across the United States. In these maps, he defines 'reasonable' sunrise and sunset times as 7 a.m. and 6 p.m.," but you can adjust those on the interactive version of the map. 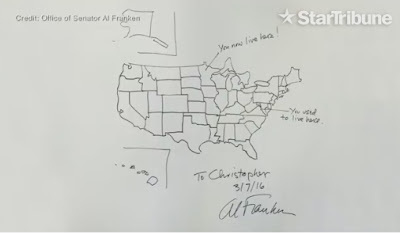 He also has maps showing what would happen if daylight time were abolished or were observed year-round. 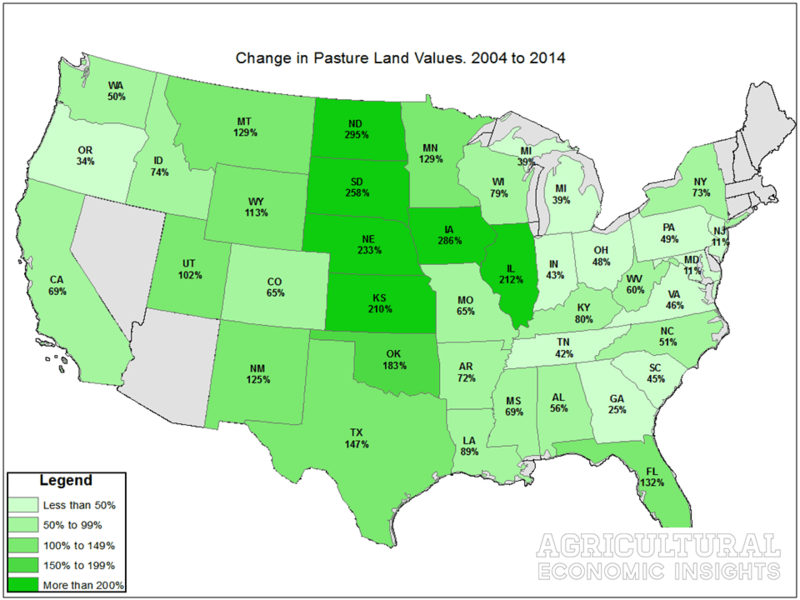 The boom in farmland values in the last decade resulted in big jumps in cropland value and cash rents, David Widmar reports for Agricultural Economic Insights. Many counties also saw significant increases in the cost of rent for farmland, Widmar writes. 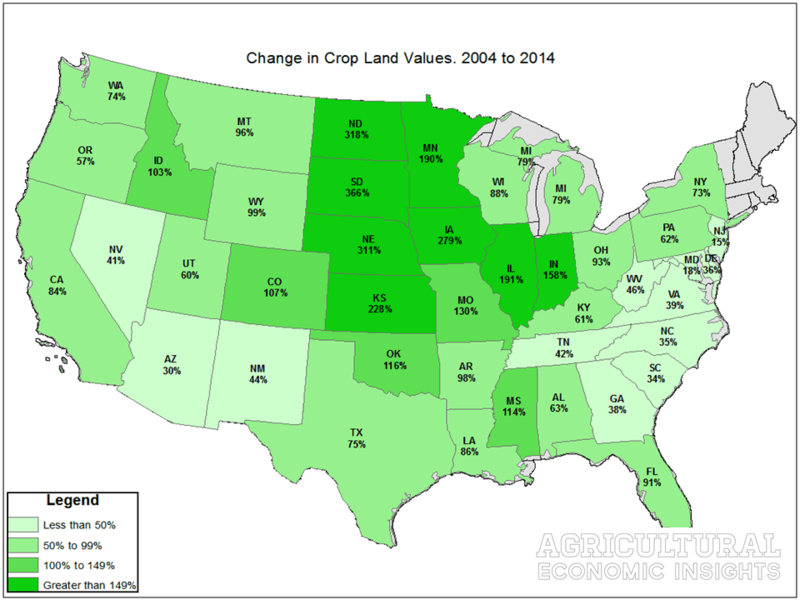 "Pockets of counties with large increases are most prevalent in South Dakota, Minnesota, Eastern Nebraska, and Northern Iowa. 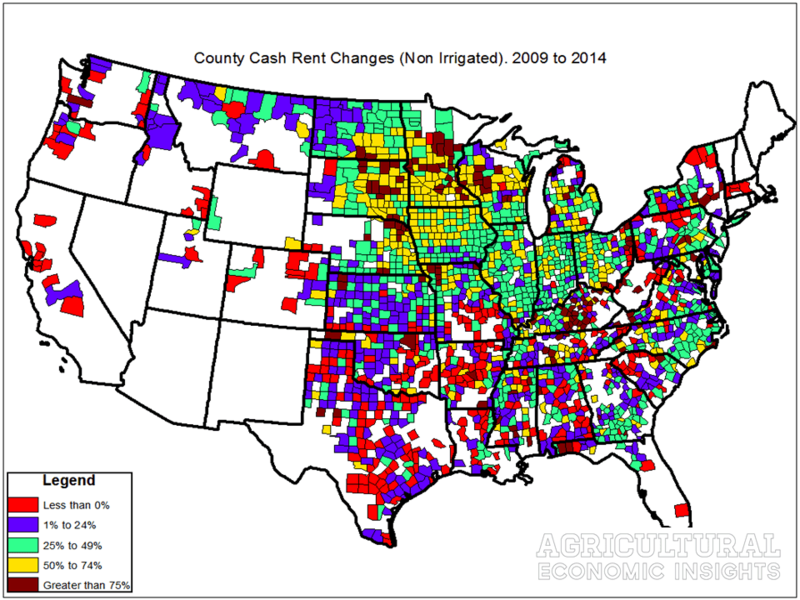 In the Southern Plains and Southeastern U.S., small and negative changes in county cash rental rates were most common." Northern Illinois University professor Norman Walzer, who worked on a December report on local government consolidation, "said the baseline question is whether two or more units of government are needed if they do essentially the same thing and cover the same people," Povich writes. He told her that “Logically, the answer is ‘no,’ ” but added that "history, politics and pride most times combine to undermine logic." One problem is that overlapping governments create confusion, Povich writes. 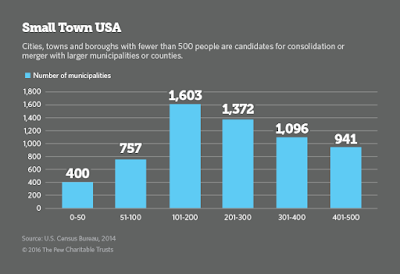 "The number of governmental entities has grown so much that states sometimes don’t even know how many municipalities or municipal authorities they have. Illinois identified 8,480 units of government that can collect taxes or have some fiscal authority, Walzer said." Jeff Fulgenzi, senior planner with Citizens’ Efficiency Commission, said "Illinois statute allows for tax collectors at the township level, but 96 percent of property tax payments are made to the county treasurer, not the township." Central Appalachian counties in Kentucky and West Virginia are the leading examples of the declining coal industry and the desperate search for new careers and economic opportunities. An Appalachian area often forgotten is in eastern Ohio, along the Pennsylvania and West Virginia borders, where there are few other good-paying jobs, Maria Gallucci reports for International Business Times. In the area around Stuebenville, Ohio (Best Places map) "trucking is among the few industries that boast abundant openings and decent wages, at around $20 an hour." 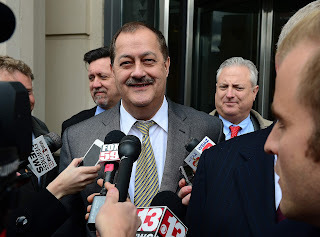 "Murray Energy Corp., the country’s third-biggest coal producer, slashed more than 1,800 jobs—21 percent of its workforce—at its mines in Ohio, West Virginia and Illinois," including more than 300 positions at the Marshall County, Ohio mine, Gallucci writes. "Then came the second layoff, on New Year’s Eve. Murray Energy, based in St. Clairsville, eliminated more than 100 positions at the Marshall County mine and hundreds more in Appalachia." For people like former miner Danny Hepburn, that meant going from earning more than $1,000 a week to being unemployed to looking for a new career as a semi-truck driver, one of the few thriving careers in the region, now that retailers are ordering and transporting more goods, Gallucci writes. "Locally, Ohio’s growing oil-and-gas sector is helping, too, by hauling in drilling equipment and shipping out wastewater." Many livestock producers, economists, government agency staff and representatives from livestock, veterinary and feed industry organizations are unfamiliar with U.S. Food and Drug Administration regulations concerning antibiotics in food-producing animals, according to a report from Farm Foundation. The report was based on information gathered from 12 workshops, attended by more than 180 people, held across the country last year. "A lack of knowledge about new policy requirements on the use of antimicrobial drugs in food animals, as well access to veterinary services are critical barriers to the successful implementation of these federal policies," states a Farm Foundation press release. Foundation President Neil Conklin said, "Despite months of work by organizations, agencies and media outlets, many stakeholders lack a full understanding of the policies that have been put in place by the Food and Drug Administration. This lack of knowledge is a critical barrier to successful implementation of the policies, which take full effect at the end of 2016." 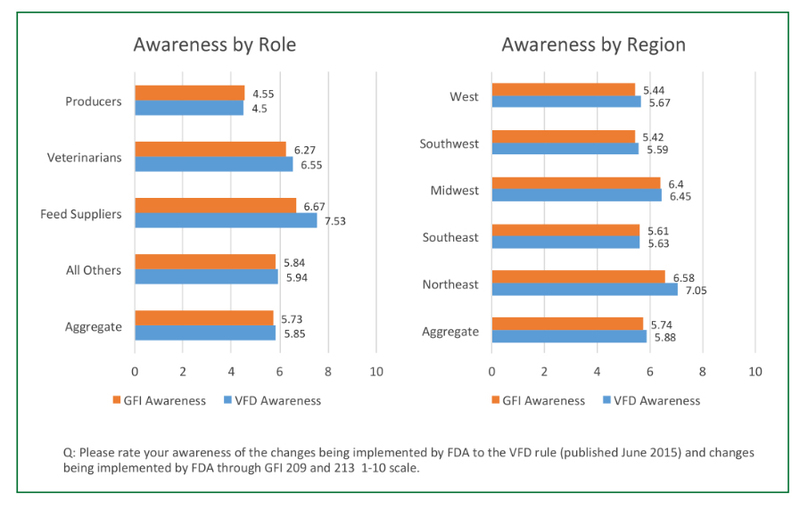 On a scale of 1 to 10, respondents ranked their awareness of FDA's Guidance for Industry (GFI) at 5.7 and its Veterinary Feed Directive (VFD) at 5.8, states the report. Feed suppliers were the most familiar with both regulations, averaging 6.7 for GFIs and 7.5 for VFDs. 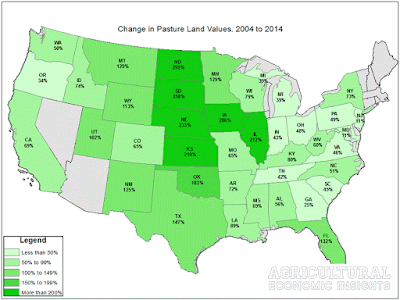 Producers only averaged 4.55 and veterinarians 6.27. The highest level of awareness for both regulations was in the Northeast. "Less than half of workshop participants were clear about their responsibilities under the VFD rule; however, 80 percent of the online survey respondents indicated that they understood the GFIs after being provided with information about the content," states the report. "When asked to identify the greatest barriers to compliance, online survey participants ranked the lack of education at the top of the list. The most common source of information and education is the Internet." Appalachian Conference on Social Enterprise scheduled for March 17-18 in Huntington, W.Va. The inaugural Appalachian Conference on Social Enterprise will be held March 17-18 at Marshall University in Huntington, W.Va. Hosted by the university's entrepreneurship program and Lewis College of Business, the conference will look "at business and non-profit models that support the community and the environment," Brandon Roberts reports for The Herald-Dispatch in Huntington. "With more than 30 presenters, sessions will cover a range of topics including how to make your business idea a reality, structures of incorporation, branding and marketing a social enterprise, new and alternative funding models, and current trends in social enterprise," Roberts writes. "Participants will also hear from successful social entrepreneurs on how and why they decided to choose social enterprise as their business model and how it is impacting their workers and their community." For more information or to register for the event click here. Continued closures of rural hospitals — more than 50 have closed in the last six years and 283 more are listed as being in fragile financial condition — is costing small towns much needed jobs and putting residents in the unenviable position of needing to drive long distances to see doctors or seek emergency care, Sarah Varney reports for Kaiser Health News. "The pace of closures has escalated in recent years, hastened by a series of budget control measures passed by Congress that reduced Medicare payments and by the Affordable Care Act, which is slowly restructuring the health care industry," she writes. "The law rewards scale and connectivity—difficult goals for rural hospitals that are, by their geographic nature, low-volume and remote. Compounding their financial troubles, 19 states have not taken advantage of a key provision in the health law to expand their Medicaid programs. That’s left many rural hospitals with uninsured patients just as federal subsidies for taking care of the uninsured are being reduced." 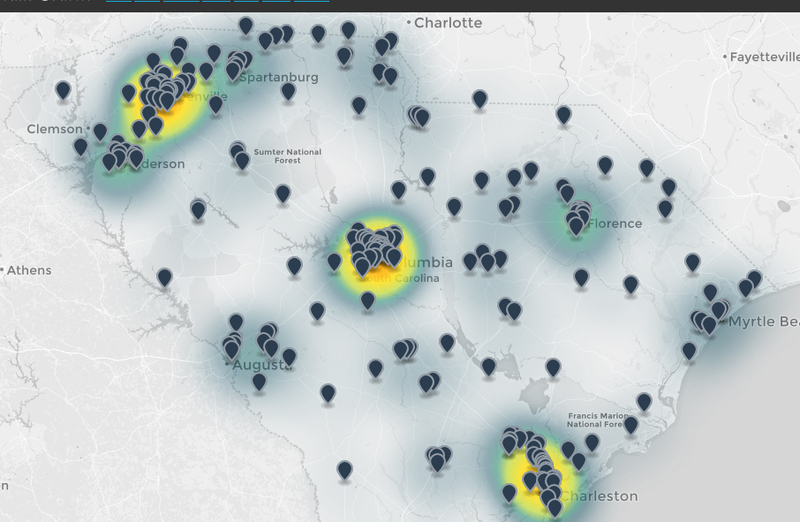 The effect of hospital closures on small towns like Glenwood, Ga. (Best Places map: Glenwood has about 700 residents) has been devastating, Varney writes. 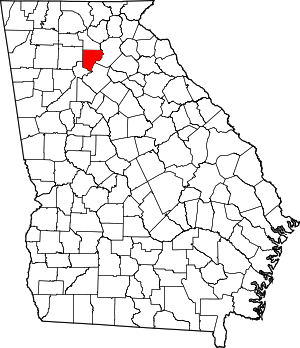 Lower Oconee Community Hospital, which recently closed, "was the town’s largest employer and without the daily traffic from its 100 employees and families and friends of its patients, the town’s only restaurant closed, followed soon by its only bank." D.K. Patel, owner of the local grocery store, told Varney, “After the hospital closed, we dropped about 30 percent sales. All I can say is it’s been hurting a lot.” In addition to losing jobs, the hospital closing has forced residents to drive hours for medical care. "For pregnant women in rural Georgia, the hospital closures can mean dwindling access to prenatal care and longer trips when labor begins," Varney writes. "In Waynesboro, Ga., Dr. Frank Carter, a prenatal specialist, said after the troubled local hospital there closed its labor and delivery unit, his patients—largely poor women with little money for transportation—face an hour’s drive to deliver their babies." "But while hospital closures in rural areas can unsettle residents’ nerves and force them to travel farther distances, the effect on health outcomes remains unclear," Varney writes. 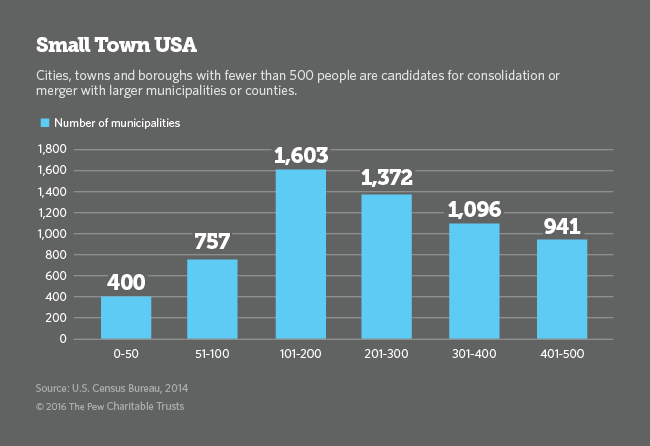 "Researchers have found that closing down a rural hospital does not increase the chance of death, and, an investigation by The Wall Street Journal found surgeries at many rural hospitals carried a greater risk of complications. Indeed, for some emergencies, patients can receive better quality care at larger hospitals that treat more cases." The death of a 13-year-old in 2009 in Fredericksburg, Texas (Best Places map)—after an inattentive emergency room doctor failed to properly treat the boy—helped lead to changes, saving the rural hospital from closing and transformed it from a struggling entity into one of the top 100 hospitals in the country, Sarah Varney reports for PBS NewsHour. Williams said he studied the Toyota plant in San Antonio and hired former Toyota employee Jeff Darnaby to help bring the car company’s revered assembly line principles to the hospital, Varney writes. Darnaby told Varney, “The Toyota production system basically allows you to identify waste, and remove that waste from your processes. Anything that doesn’t add value to the customer, to the process, is considered waste.” Williams also "turned to a former executive with Southwest Airlines to remake the hospital’s values and culture, and he hired a former trainer from Ritz Carlton, known for its legendary customer service, to change how patients and families were treated." Each department at the hospital now "candidly displays specific goals for everyone to see: reduce ER wait times, eliminate falls and improve customer satisfaction," Varney writes. Williams told her, “We took the approach that if we took patients and we treated them better than they’d ever been treated before, that at the end of the day, they would drive the bottom line." Varney writes, "The sweeping changes can be seen everywhere: staff members, including physicians, greet visitors in the hallway and ask if they need directions; during a daily afternoon quiet time, the hallway lights darken so patients can rest; and the kitchen staff, in an attempt to reduce waste, cut their egg budget in half. Along with other cost saving measures, the hospital cut costs by $600,000." The hospital has since "won the nation’s highest presidential honor for excellence through innovation and leadership." Duke, which claims the fine was purposely made too high to be "a newsworthy amount" and counteract bad publicity concerning Gov. Pat McCrory's close ties with Duke—where he worked for 28 years—filed the appeal Wednesday with the state Administrative Hearings Office, Downey writes. "The appeal compares the Dan River fine to a $25.1 million penalty the DEQ imposed on Duke last year for clean water violations at its Sutton coal plant. DEQ later had to admit it could not impose that fine. The state negotiated a $7 million settlement with Duke in that case ... Duke accused DEQ of improperly using admissions Duke made of federal violations in a misdemeanor case last year and then imposed daily fines for the violations dating back to Jan. 1, 2012." A Washington Post reporter who made snarky comments about a rural town being ranked dead last among the nation's most desirable places to live—based on a natural amenities index—is now packing his bags and moving to the town. In August Christopher Ingraham wrote, "The absolute worst place to live in America is (drumroll please) Red Lake County, Minn.." Ingraham changed his tune about Red Lake after residents invited him to visit and he did. "I kept dreaming about big skies. Broad rivers," Inrgraham writes. "Flat roads running to the horizon and towns that smelled of wood and grain and dry prairie air. ... I commute in to D.C. most days. A one-way trip, involving car, train, metro and a walk takes about 90 minutes on a good day. I count myself among that woebegone 2.62 percent of workers who spend 15 hours or more each week stuck in traffic, shivering on subway platforms, and otherwise squandering a huge chunk of their waking hours on one of their most-hated activities." 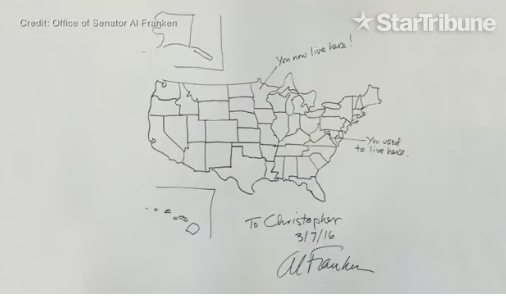 But he says he can and will do his job, data journalism, from home. "For me, a 15-hour commute meant a lot of things," he writes. "It meant going on blood pressure medication at the age of 34 because there's no time to exercise. It meant getting to see the kids for maybe 30 minutes on a good night, at the end of the day when we're all tired and ornery. It meant missed opportunities to read, write and think, because it's hard to do justice of any of those things in the calm intervals of a commute involving four modes of transit. And so, I decided, it was time to shake things up." His mom suggested, "What about moving to that nice place you visited over the summer?" 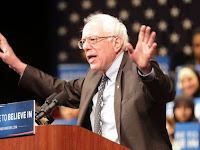 Democrat Hillary Clinton collected 11,000 more votes than Vermont Sen. Bernie Sanders in urban areas in Michigan, beating him 49.6 percent to 48.6 percent in cities, but it was rural areas and micropolitan areas that carried Sanders to the upset, Bishop and Marema write. Sanders beat Clinton in rural areas by 8,000 votes—earning 55.3 percent of the votes to 42 percent for Clinton and also got 22,000 more votes in micropolitan areas—59.9 percent to 37.9 percent—to finish with 19,000 more votes than Clinton. In the Republican race in Michigan, businessman Donald Trump won 42.9 percent of rural votes, compared to 25.6 percent for Texas Sen. Ted Cruz and 18.2 percent for Ohio Gov. John Kasich, Bishop and Marema write. Trump, who also won in cities and micropolitan areas, finishing with 36.5 percent of overall votes, to 24.9 percent for Cruz and 24.3 percent for Kasich. 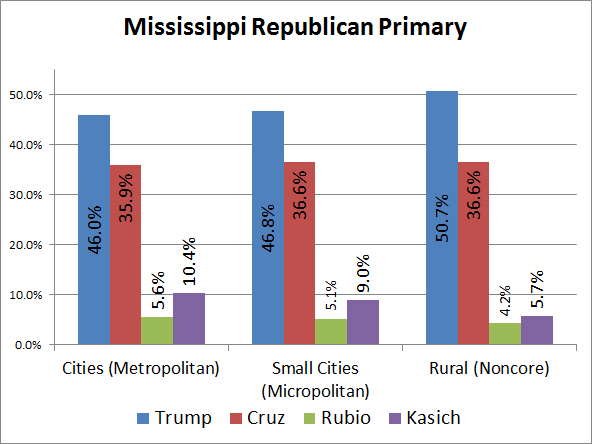 Trump also took rural areas in Mississippi, beating Cruz 50.7 percent to 36.6 percent. 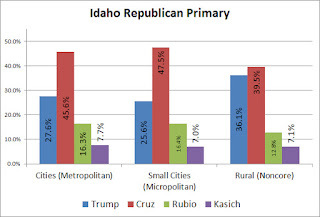 Overall, Trump won the state with 47.3 percent of votes to 36.3 percent for Cruz. Flame retardants commonly used in furniture, electronics, construction materials and textiles are contaminating smallmouth bass in Lake Erie and posing health concerns for people that consume the fish, says a report published in Science Direct, Morgan Linn reports for the Great Lakes Echo, a project of the journalism department at Michigan State University. Despite being discontinued in 2013, polybrominated diphenyl ethers (PBDEs) are still in Lake Erie water and sediment, says the study. PBDE dust particles spread through the air and contaminated the lakes, said Michael Murray, a staff scientist for National Wildlife Federation’s Great Lakes office in Michigan. Rural voters in Michigan carried Vermont Sen. Bernie Sanders to a surprise win over Hillary Clinton on Tuesday, Perry Bacon reports for NBC News. Despite polls showing Clinton had a huge advantage entering the primary Sanders pulled off a narrow victory, 49.9 percent to 48.2 percent, even though Clinton earned more delegates, 68 to 65 (with 99.4 percent of precincts reporting). "Sanders carried more than 60 percent of the vote in many counties. His performance in Michigan suggests Sanders could win rural counties in Ohio, Illinois, Florida and Missouri next week, a potential path to victory in those states if he does not overwhelmingly lose the black vote." Sanders carried the 16 percent of Michigan vote that is rural by 57 percent to 43 percent, Todd Spangler and Kathleen Gray of the Detroit Free Press report: "Practically every poll leading up to Tuesday's election showed Clinton with a double-digit lead and a vast institutional edge with African-American voters. But Sanders predicted on Monday that a surge in turnout could deliver him the victory, and it did—more than 2.2 million votes were cast in the Democratic and Republican primaries, well above the record 1.9 million counted in 1972." The staff of The Post and Courier in Charleston, S.C. was awarded the Community Journalism prize in the 2015 Scripps Howard Awards for its series, "Shots Fired," an in-depth analysis of the state's handling of every police-involved shooting since 2009 "that revealed the state's failure to learn and properly investigate shooting cases," the Scripps Howard Foundation says. The shootings were spread throughout the state, including in many rural areas. Recipients of the journalism awards will be honored in Scottsdale, Ariz., on April 28. To view other award winners click here. Judges wrote of the series: "We applaud the exhaustive research, including scouring more than 30,000 documents, hours of video and an analysis of more than 400,000 stops involving law enforcement officials in South Carolina. The reporting and writing were compelling, as was the chilling video. The project has created a positive chain of reaction. It has forced local, state and federal law enforcement officials to re-evaluate how they investigate and respond to shootings." "Each shooting also triggered an investigation into whether officers were justified in using deadly force," The Post and Courier reports in the series. "With just a few notable exceptions, these officers were cleared of any wrongdoing. To be sure, many cases were open and shut: Armed robbers shooting their way out of convenience stores after holdups; rage-filled drunks bent on destruction; suicidal people daring cops to cut them down. "But a Post and Courier investigation uncovered case after case where agents with the State Law Enforcement Division failed to answer key questions about what happened, failed to document the troubled backgrounds of the officers who drew their guns, and failed to pinpoint missteps and tactical mistakes that could be used to prevent future bloodshed." "Never-before released dashboard videos also reveal a disturbing pattern of officers shooting at and into vehicles," The Post and Courier Reports in the series. "In statements to SLED, officers said they fired because they were afraid of being injured or killed by these cars and trucks. But the videos show that some officers were out of harm’s way when they opened fire. And SLED case files show little or no documentation that the officers’ accounts were challenged over these inconsistencies." The series also contains the name of every person shot, the officer who shot them and the county where the shooting took place. Overall, 5 percent of total U.S. coal capacity was retired in 2015, Jeff Swensen reports for International Business Times. While cheaper natural gas has been blamed for some closures many of the coal units, especially older ones, "couldn’t comply with the Environmental Protection Agency’s tougher rules for mercury and toxic air emissions, which went into effect in April. More plants are expected to close this year due to the rule. The Obama administration’s Clean Power Plan, which regulates carbon dioxide emissions in the power sector, could force additional closures in coming years." The Sierra Club said that "more than 230 coal-fired plants have been closed or are slated for closure—or 44 percent of the 523 U.S. coal plants that were in operation just six years ago." 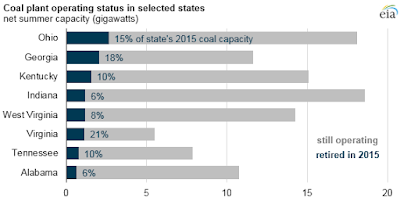 Coal-heavy states like Kentucky, which retired 1.5 gigawatts last year, should expect to see its coal capacity shrink again this year, Curtis Tate reports for McClatchy Newspapers. East Kentucky Power Cooperative, which shut down two units at its Dale Station in 2015, will place the two remaining units "with a combined 150 megawatts, in indefinite storage next month. By the end of 2017, the Tennessee Valley Authority will shut down two units in Western Kentucky, at 1.4 gigawatts. A third, 1.1 gigawatt coal unit will remain in service." More than 40 percent of typical American news consumers would be willing to pay for a digital newspaper subscription if it included exclusive content, including local news, says a survey from Meclabs Institute. The poll surveyed 900 consumers 25 and older with household incomes of $40,000 or higher who spend three hours or more in a typical week consuming news in print or digitally. It found that 41 percent are not opposed to paying for a digital subscription and 19 percent are open to the idea, if they had access to "arts/culture, local news, editorials/opinions, crosswords/games—as well as their own personal characteristics such as preference for outlets that align with their political point-of-view, their conscientiousness and age," Meclabs says. The survey found that older respondents are more interested in political and government news and international news, while younger respondents were more likely to favor entertainment news. Among those 55 to 64 years old, 99 percent rated national news as essential, 94 percent international news and 98 percent politics and government. Of respondents 25 to 34, 93 percent said national news was essential, 83 percent said international news and 84 percent politics and government. One big difference was in editorials and opinions, with 64 percent of respondents 55 to 64 rating it as essential, compared to 43 percent of those 25 to 34. Entertainment news was rated as important among 42 percent of 25 to 34 year-old respondents, compared to 29 percent of 65 and older, while 53 percent of those 25 to 34 rated arts/culture as important, compared to 35 percent of 65 and older and 76 percent of those 25 to 34 said science was important, compared to 59 percent of respondents 55 to 64. The Nevada Board of Examiners voted Tuesday to declare a critical labor shortage for rural Nevada prison guards, Michelle Rindels reports for The Associated Press. Of the 522 rural corrections officer positions available, as of Jan. 31, more than 100 were vacant. The problem has been especially bad at Ely State Prison, which has not been fully staffed in five years. Understaffed prisons force employees to work overtime, which has been known to cause burnout, leading to fatigued guards and creating dangerous situations. The main problem is that rural prison guard jobs are "low-paying compared with other law enforcement careers, can involve harassment from inmates and means living in far-flung communities short on affordable housing," Rindels writes. Another problem is that many of the prisons are located in areas with high paying mining jobs, which are more likely to draw applicants than prisons. A story budget for Sunshine Week has been posted, as well as links to conferences, debates and broadcasts that will be made available via the Internet for those unable to attend. Sunshine Week, an annual event to celebrate open government and freedom of the press, celebrates its 11th year from March 13-19. National Freedom of Information Day is March 16, the birthday of James Madison, father of the First Amendment. 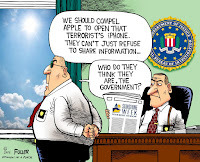 Even before Sunshine Week begins, the 2016 National Freedom Information Day Conference will take place at the Knight Conference Center in Washington D.C. on Friday, March 11, "Hosted by the Newseum Institute’s First Amendment Center with OpenTheGovernment.org, the American Society of News Editors, Sunshine Week and the American Library Association, the conference will gather individuals from all areas relating to freedom of information and open records to address transparency in government and freedom of information laws and practices," states the conference website. The conference is free but registration is required. To register click here. From 7 to 8:30 p.m. CDT on March 15 the Donald W. Reynolds Journalism Institute and the Harry S Truman School of Public Affairs will host a debate, "Is Our Government Too Open? ", at the Fred W. Smith Forum at the University of Missouri. Bruce Cain, professor of political science at Stanford University and director of the Bill Lane Center for the American West, and Charles Lewis, American University professor and founder of The Center for Public Integrity, will debate on transparency in the federal government. The event will be streamed live. To register for the event click here. The Newseum, an interactive museum in Washington D.C. that makes more than 900 newspaper front pages from 90 countries available for viewing every day, will broadcast live from South by Southwest in Austin, Texas from 11 a.m. to 5 p.m. (EDT) from March 12-14. "The three-day broadcast will be anchored by Gene Policinski, COO of the Newseum Institute, and Sonya Gavankar, frequent host of Inside Media and other Newseum programming, and will feature interviews with key thoughts leaders in tech, media and privacy," states Newseum. Also at 10 a.m. (EDT) on March 13, "Newseum CEO Jeffrey Herbst will be joined by Washington Post Executive Editor Marty Baron for a coffee fireside chat on how the rapid evolution of media technologies has fundamentally changed the news business and will continue to affect an informed citizenry and our democracy," the Newseum says. The Sunshine Week site will also provide other tools, including opinion columns, editorial cartoons, Sunshine Week logos and icons, a sample proclamation for state and local governments, the Schools and Colleges page for students and educators and a series of open government questions to ask candidates running for federal positions. Rural voters in Ky., La. 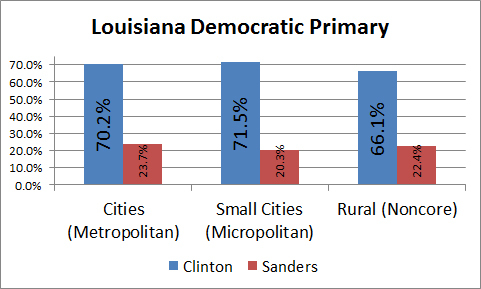 favor Trump; Cruz takes rural Maine; Clinton dominates Sanders in rural La. Trump earned 46.3 percent of the rural vote in Kentucky, on his way to winning the state over Cruz by 35-31. Cruz got 29.2 percent of rural votes, Ohio Gov. John Kasich 12.2 percent and Florida Sen. Marco Rubio 10.4 percent. Trump was especially popular in Eastern Kentucky coal counties and rural Southern Kentucky, but lost badly to Cruz in Western Kentucky. 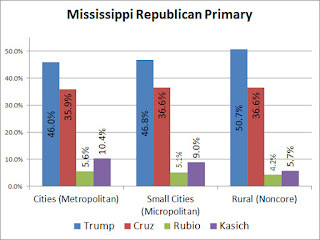 Trump edged Cruz for rural votes in Louisiana, 44.1 percent to 39.2 percent, a slightly larger margin than overall, while Rubio was a distant third with 8.9 percent of rural votes. Cruz turned the tables in Maine, winning 46.1 percent of rural votes on his way to winning the state. 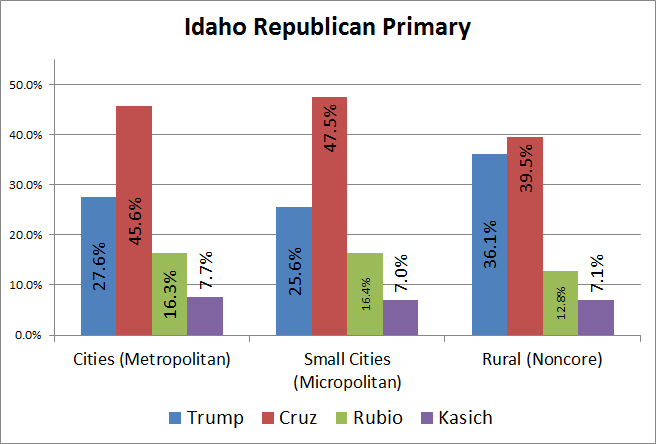 Trump scored 33.7 percent of rural votes, Kasich 11.1 percent and Rubio 7.4 percent. In the overall vote in Kansas, Cruz beat Trump 48.2 percent to 23.3 percent. 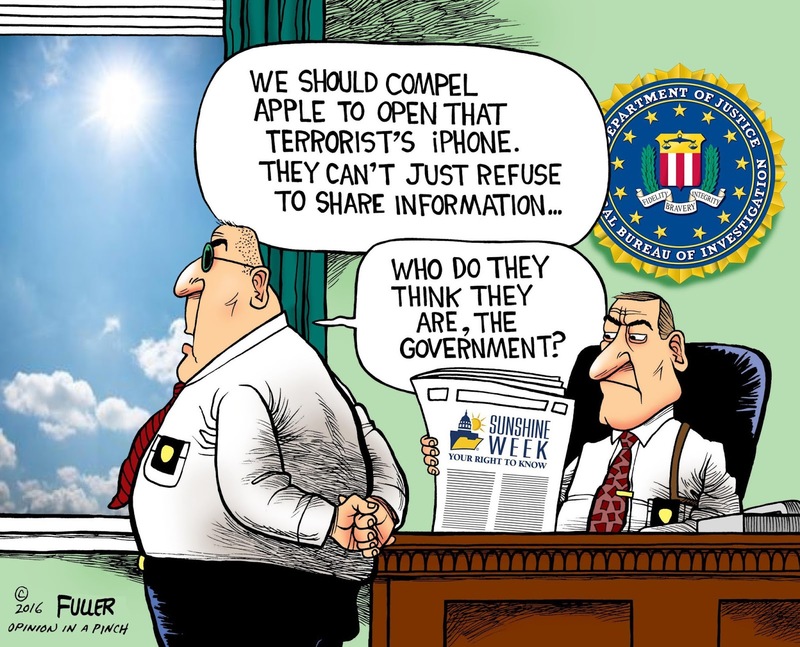 Apple chief executive Tim Cook—an openly gay man, a champion for gay rights, and a native son of the rural South—is at the heart of a controversy, having refused to assist the FBI in unlocking an iPhone belonging to one of the San Bernardino terrorists. Cook's childhood growing up in the 1960s in rural Robertsdale, Ala. (Best Places map) forged his current ideals about right and wrong and the need for privacy, especially from the government, Todd Frankel reports for The Washington Post. Cook was instilled with a sense of right and wrong at an early age, Frankel writes. "In the early 1970s, he was riding his new 10-speed bicycle at night along a rural road just outside Robertsdale when he spotted a burning cross. He pedaled closer. He saw Klansmen in white hoods and robes. The cross was on the property of a family he knew was black. It was almost more than he could comprehend. Without thinking, he shouted, 'Stop!' The group turned toward the boy. One of them raised his hood. Cook recognized the man as a local deacon at one of the dozen churches in town, but not the one attended by Cook’s family. The man warned the boy to keep moving." Cook said at a speech in 2013, “This image was permanently imprinted in my brain and it would change my life forever." 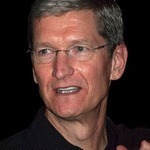 In 2011, when he took over Apple, Cook began advocating "for gay rights and to change laws in states such as Alabama, where employees can be fired for being gay," Frankel writes. "He criticized states with 'religious freedom' laws that seemed to him to sanction some forms of discrimination. Last December, shortly before the fate of a terrorist’s iPhone would explode onto the national scene, he accepted the Ripple of Hope award from the Robert F. Kennedy Center for Justice and Human Rights. In his speech, Cook talked about learning to 'take a stand for what is right, for what is just.' And when the terrorist’s iPhone case erupted last month, Cook returned to that 'moral sense' he learned back in Robertsdale." DUBLIN, Ireland – Print newspaper readership remains strong throughout rural Ireland despite the growth of online media and the ravaging of the local newspaper industry after the 2008 collapse of the “Celtic Tiger” economic bubble, according to the director of the national organization representing rural weekly newspapers. An estimated one-third of the 4.5 million residents of the Republic of Ireland read a print newspaper every week, and community weeklies serving the predominantly rural country enjoy high levels of trust and value, according to research commissioned by Local Ireland, which has a membership of about 50 “newspapers of record” across all 26 counties. Circulations vary, but the average Irish weekly is between 8,000 and 9,000 per week, and Local Ireland’s members range in circulation from 5,500 to 22,000 per week. Gone, though, are the heady days before 2008, when Ireland’s economy was booming, rural newsrooms were fully staffed, and thick weekly editions were brimming with ads, said Johnny O’Hanlon, director of Local Ireland and a former editor of The Anglo-Celt in County Cavan. After the 2008 economic crash, newsroom staffs were reduced dramatically, pension funds were folded, local job-printing all but dried up, and independently owned papers that had been in families for generations were sold to larger publishing groups. “In a word, it was ‘carnage’,” O’Hanlon said. But the belt-tightening was able to save the vast majority of Local Ireland’s member newspapers from shutting down, and the community press in Ireland remains strong largely due to audience loyalty. About a third of the population reads a local newspaper every week, more than 75 percent consider their local weekly to be well worth the cover price (which approaches US$3 in some cases), and 63 percent trust their paid local weekly more than free news sources, according to Local Ireland’s most recent survey data. Although that survey data is dated (2011, just as Ireland’s economy was starting to creep out of depression), O’Hanlon said the rural newspaper industry remains popular across most demographic groups. One surprising detail from the 2011 survey was the relatively high percentage of regular readers who are young adults — 30 percent of community newspaper readers are aged 18 to 34. Most of Local Ireland’s members publish online too, but just like newspapers around the world, they are finding it difficult to monetize online content, especially given that there remains a consistent demand for ink-on-paper news and advertising; 72 percent of those surveyed agreed that “It’s a tradition in our house to have a copy of the weekly local newspaper in our house to read,” and that copy is kept in the house for an average of nearly 6 days before it is tossed or recycled. The persistent popularity of Ireland’s weeklies belies significant changes behind the scenes. In addition to deep staffing cuts since the economic collapse, most weeklies also have shut down and sold their presses, such that now only one Local Ireland member still prints its own newspaper — the rest are printed at a handful of commercial printers around the country, O’Hanlon said. A number of mergers and acquisitions also have consolidated ownership into several small-to-medium-sized newspaper groups. Iconic Newspapers now hold 12 newspapers and Celtic Media Group has six. Several of Ireland’s regional weeklies are owned by global giant Independent News and Media, publisher of Ireland’s largest national daily, the Irish Independent (the “Indo”), and some 200 other print titles around the world. Those consolidations have not diminished competition, however. Most of Ireland’s 26 counties have two or more newspapers, as the community press in Ireland is focused on counties rather than individual cities and towns. As a result, the market remains competitive for advertising, news, and readers. The number of babies born in Wisconsin addicted to heroin increased 125 percent from 2009 to 2014, according to data from the state Department of Health Services and Department of Children and Families, Liz Welter reports for the USA Today Network-Wisconsin. While the numbers are statewide, opiate addiction has become an increasing problem in rural areas, especially some of the state's smallest counties. Data show that from 2009 to 2012 Wisconsin had 2,362 babies born addicted to heroin, Welter writes. "Since 2008, every county in central Wisconsin has reported growing numbers of heroin-related arrests." Officials cite an increased cracked down on meth production, a rise in physicians restricting the amount of opiate-based pain relievers prescribed and cheaper heroin with the increase in opiate use. "Tim Baker, director of the commission's Oil and Gas Conservation Division, said the central Oklahoma plan, like the northwest one, will reduce the total volume of wastewater by 40 percent below the totals from 2014," Monies writes. "The volume reduction plan will be phased in over two months, with full compliance expected by May 28." Oklahoma had more earthquakes in 2015—more than 900 of magnitude 3.0 or higher—than the combined total of every state except Alaska. 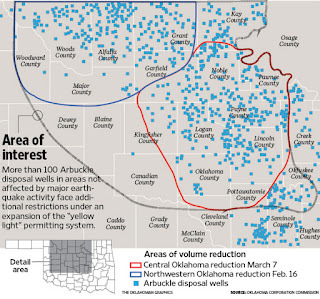 Prior to the oil and gas boom of 2009, Oklahoma averaged two earthquakes of magnitude 3.0 or higher per year. This year more than 200 earthquakes of magnitude 3.0 or higher have been recorded, including seven of magnitude 4.0 or higher, Monies writes. "The central Oklahoma plan covers more than 120 operators." Of the 25 U.S. counties that have lost the most coal jobs since 2011, 17 are in Kentucky and West Virginia. Boone County, West Virginia has suffered the most losses, falling from an average of 4,608 at the end of 2011 to 1,439 at the end of 2015. Pike County, Kentucky, lost 1,837 mining jobs. Environmental advocates fear that Kentucky has been a dumping ground for radioactive waste from an oil and natural gas boom in Ohio, Pennsylvania and West Virginia, James Bruggers reports for The Courier-Journal of Louisville: "Kentucky does not require any radiation screening at landfills. Landfill operators count on haulers to honestly describe the wastes they bring for disposal." But representatives at a east-central Kentucky landfilly "say they were duped and not told that sludge from West Virginia was dangerously radioactive, as state officials believe." Illegal dumping was believed to have occurred in two Eastern Kentucky counties. Kentucky's leading environmental lawyer, Tom FitzGerald, told Bruggers that a working group charged with making recommendations to modernize state oversight of oil and gas drilling needs to resume its deliberations. Kentucky Energy and Environment Secretary Charles Snavely, a former coal company executive recently appointed by newly elected Republican Gov. Matt Bevin, "said that group will begin work again and is being charged with evaluating potential remedies for harmful substances," Bruggers reports. Snavely told him, “If our current rules and procedures require modification, we’ll make those modifications.” Snavely previously "expressed skepticism about any new oil and gas drilling regulations, noting the impact of pending budget cuts." He told the advsory Environmental Quality Commission, "My question is where is the money going to come from to do the regulating?" Bevin has called for a 9 percent budget cut to shore up state pensions. The American Society of News Editors and the Reporters Committee for Freedom of the Press have worked with The Associated Press, The McClatchy Company, the Milwaukee Journal Sentinel, The Sacramento Bee and Tribune News Service to produced a reporting package that includes a comprehensive series of news stories, photos and graphics that will be available free to all participants. The complete story budget and links are available by clicking here. 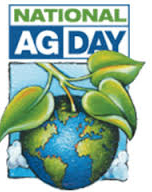 National Ag Day, a day to celebrate agriculture, is scheduled for March 15, right in the heart of National Ag Week, from March 13-19. National Ag Day is a great time to recognize the importance of local agricultural by encouraging readers to: Understand how food and fiber products are produced; value the essential role of agriculture in maintaining a strong economy; and appreciate the role agriculture plays in providing safe, abundant and affordable products, states the National Ag Day website. "By building awareness, the Agriculture Council of America is encouraging young people to consider career opportunities in agriculture," states National Ag Day. 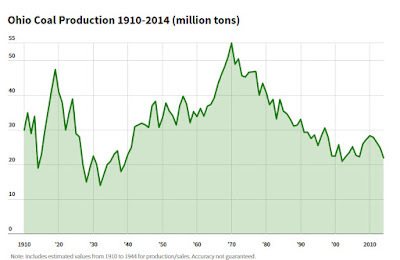 "Each American farmer feeds more than 144 people... a dramatic increase from 25 people in the 1960s. 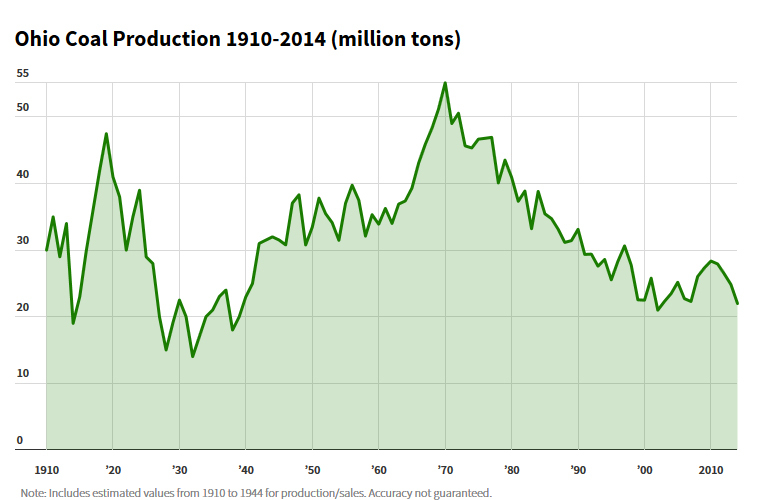 Quite simply, American agriculture is doing more - and doing it better. As the world population soars, there is an even greater demand for the food and fiber produced in the U.S." More information about National Ag Day can be found by clicking here or calling the Agriculture Council of America at 913-491-1895. 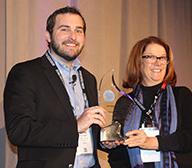 The thrice-weekly Forsyth County News in Georgia won the Mega-Innovation Award presented at the recent Key Executives Mega-Conference for newspaper leaders. "Publisher Vince Johnson says that when he came to the paper a couple of years ago, it had a rule about social media. Only one article was posted to Facebook each day, at 6 a.m.," Jane Nicholes reports for the Southern Newspaper Publishers Association, a sponsor of the conference. Johnson said on his entry form that he changed that rule when he became publisher of the "wildly traditional" paper about two years ago, instituting repeated social-media promotion of stories, and the paper has since increased its social-media following by more than 1,000 percent. Nicholes writes, "The county is fairly affluent and its residents are attuned to new ways of communicating and receiving information, Johnson said." The paper also revamped its staff, with new job descriptions and some layoffs; started a "Best of Forsyth" contest, special online advertising offers and a platform aimed at college students; raised subscription rates (with little protest, Johnson says) and used the video component of its website as a brand to sponsor local events. Johnson told Nicholes, "We certainly represent the small- and medium-sized newspapers and how you can innovate in an area and a place where you don't have tons of resources, and you're not a huge corporation or anything like that." One conference attendee, Arkansas Press Association Executive Director Tom Larimer, wrote in Arkansas Publisher Weekly: "Small newspapers are the prime targets for acquisition. Once considered the country cousins of the newspaper industry, it’s the smaller newspapers operating outside the metro areas that are figuring out how best to capitalize on the new opportunities before them. Where once these newspapers looked to the metro dailies across the country as the go-to sources for how to do things in the newspaper industry, it is the smaller dailies and non-dailies across the country that are now taking the lead. And they are prospering as a result. There are reasons for this, and it’s not because the operators or smaller newspapers are smarter or luckier, although that is sometimes the case. For the most part, smaller newspapers are more flexible in how they go about doing things. They can react to situations faster, and to make dramatic changes to their business model faster than their behemoth cousins in the city." Since businessman Donald Trump appears likely to be the Republican nominee for president, and hates the news media so much that he has said he will change libel laws to make it easier to sure journalists and their employers, it might be a good idea for them to explain to their readers, viewers and listeners just what the rules of libel are. Donald Trump said [recently], “I'm gonna open up our libel laws, so when they write purposely negative and horrible, false articles, we can sue them and win lots of money.” The specific media outlets he mentioned were The New York Times and The Washington Post. The first thing to understand is that under the landmark Supreme Court case of New York Times vs. Sullivan, it was determined that news organizations could be found liable when they deliberately publish false information. The specific standard is “actual malice.” So if Mr. Trump wants to address media organizations that “write purposely negative and horrible, false articles” then the law is already established as to his rights to do that. But we all know that Mr. Trump isn't interested in legalities in this case. He is clearly just trying to intimidate news organizations and bully them in providing more positive coverage of him and his candidacy for president. He should pick a different target. Newspapers have dealt with more intimidating figures than Mr. Trump. Newspapers, actually, have a long, long history of responsibly speaking truth in the face of great power. One could think of Watergate or the Oscar-winning movie “Spotlight” for some better-known examples. Throughout history, those in power have complained about newspaper reporting when it didn't meet their agenda and the number of instances where the reporting has been found to be on target has vastly out-weighed any circumstances where it wasn't. The fact is that our society relies upon the newspaper industry to be a consistent, challenging voice to the wealthy and powerful -- and newspapers have a long history of carrying out that mandate with care and a deep sense of responsibility. Newspapers have successfully stood up to sitting presidents, vast religious organizations, governors, mayors and immensely powerful corporations, among many others. If Mr. Trump wants to try to bully news organizations into providing reporting that he likes, then he will have to do a whole lot better than making weak, misguided promises about changes to a law that aren't needed in the first place.